Habokam has together with Space Metals Group, Inc., developed the least frictional surface - on an alloyed metal skeleton - globally, protecting each single vulnerable hairstraw. Top model Svetlana S uses an alloyed anodized aluminum hair comb from Habokam daily. CGR Ekman, Chairman of Space Metals Group, Inc., Habokam/Tannery Hair Comb International Limited, and The Ekman/Galen Institute of Space Metals Technology. Habokam presents a comprehensive program of high quality hand made combs, hard-wearing and practical. Available in models for every technique in hairdressing. • Handmade out of aluminium and Cellulose Acetate. Very gentle for hair and scalp. • Delivered in a stylish packaging made for recycling. • A complete merchandise set includes a display in transparent material and a selection of combs. Private labels on combs and packaging are available upon request – CONTACT US FOR FURTHER INFO. hair but were also used as decoration. and skills that we now use with the help of modern materials. 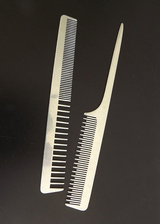 The comb is one of humans oldest accessories. Skilful combmakers have always been busy, they have always had a good market for their products. That is if the combs are well-made and have a nice appearance. This is also a fact today, and as heirs to the oldest Swedish combmaker, Habokam preserves and develop all the good craftman-ship and knowledge we have in the company. We offer the personnel as well as the mechanical resources and a well-assorted product mix of cellulose acetate and aluminium combs. Nr. 285 Pocket with cap opener 135 mm. Nr. 200 Pocket deep fine 130 mm. Nr. 261 Pocket coarse & fine 154 mm. Nr. 210 Pocket fine 146 mm. Nr 215 Pocket fine 146 mm. Nr. 1205 Pocket coarse & fine136 mm. Nr. 110 Pocket coarse & fine 150 mm. Nr 1070 Handle medium coarse 186 mm. coarse & fine 183 mm. raised/designed in Sweden, Finland, Scotland and Italy (and the Atlantic naturally). Imprinting/embossing in any colour or plain watermarking. aluminium sheet & component design of high quality. we offer with associated companies both laser & water cutting technologies. regular basis to some 26 countries worldwide with a natural emphasis on northwest Europe. GIVE YOUR CUSTOMER A COMB FOR LIFE! Habokam as a barber comb specialist and manufacturer now offers hair combs with covers in Moose/Scandinavian Elk leather, as well as in Goat ditto.The comb, and cover/holder, can both be imprinted with your name and/or telephone number. The comb will be engraved and the cover marked in gold. Your customer will surely remember his/her friseur wherever and whenever the hair needs a cut. Clearly there is a minimum order amount of 100-500 pieces, but it will probably be the best marketing money you have ever spent. The Ekman/Galen Institute of Space Metals Technology is recruiting further top-of-the-line aluminum-aluminium laser/water-cutting/welding/anodizing scientists/engineers/consultants in Moscow, Stockholm, Berlin, Paris, Beijing, Rangoon and San Francisco.